What a great weekend for football it was for pretty much everyone I know!! It was capped off by an incredible Sunday night. Step 1 of the Steelers road to Detroit is complete. We knocked off the Bengals in a crazy game that I had to watch in 2 parts. I was pretty nervous about the game all week and into the weekend. 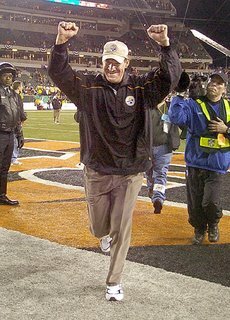 With the Steelers being favorites on the road in the playoffs, that is something that doesn't happen often. I thought it might be too good to be true. But it wasn't. Unfortunately there were a number of injuries at the beginning of the game for both teams. Even if an injury will give your team an advantage, you never want to see a Pro-Bowl caliber QB like Carson go down like that. I was happy that we were given a break by not having to face him, but that doesn't mean I wanted him to be injured or that I don't feel bad for him. And I certainly don't think that Kimo hit his knee on purpose. After watching the Panthers roll over the Giants, I was all ready to watch the Steelers do the same to the Bengals. However, that's not exactly the way the game started. After receiving the kickoff, the Steelers didn't do much on offense and turned the ball right over to the Bengals. Then several plays later, Carson got hurt. Jon Kitna came in a did a good job of helping the Bengals jump out ahead. I didn't feel like the Steelers were playing a very good game in the first half. They weren't running it and the defense was giving up some plays. However, the score was only 17-14 at the half, we were only down by 3! I was given a ticket to see Les Miserables for Xmas this year from AD. It was for a Sunday night show in January, not realizing that the playoffs would interfere with this show. Thanks to TiVo, I was able to watch the first half plus a few minutes of the game live, go to the show, and then come home and watch the rest of it! It worked out perfectly that right as we were about to leave the house, the Steelers scored and took the lead. I could watch the show in peace, knowing that we were on top. Then when I got back, I watched the Bengals get shut-out the rest of the game. It was fabulous!! Again, since we were the 6th seed, I am really worried about going into Indy to play our next playoff game, step 2 on the road to Detroit. I think that the game we played in Indy earlier in the year will be a big help for us. In addition to the lack of playing time that Indy's first team has seen lately. However, with a team like Indy, I am not sure the rust will make a difference for them. Here's looking forward to another great Sunday next weekend!! *On a side note, I think the Football Gods were looking down on Carolina because of the first game of the season that they gave to New Orleans and then the extra home game that NY got.